Home > Membership > Nonprofit World > Is Your Organization Achieving Optimal Performance? 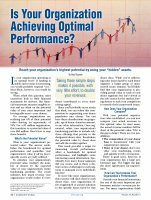 Is Your Organization Achieving Optimal Performance? Reach your organization's highest potential by using your "hidden" assets.